Provides a view into starting a business while also recasting this classic friendship series into graphic novel format. Kristy, Mary Anne, Claudia, and Stacey are the founding members of The Baby-sitters Club and, more importantly, best friends. The four girls overcome all sorts of challenges while babysitting and while managing their family and personal relationships. There are over 100(!) titles in the original classic series and the graphic novel versions are being gradually reissued beginning with this book #1. 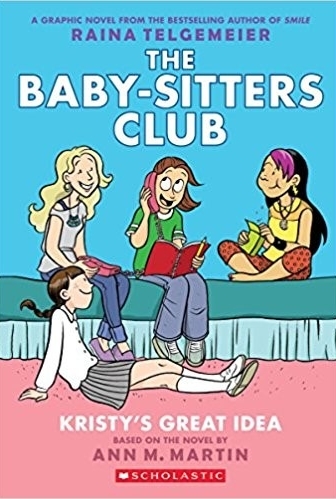 The Baby-sitters Club rebirths this classic friendship tale as a graphic novel while also giving readers a front row seat to the building of a business – from the moment of inspiration, through the forming of the team, to managing a business as a team of diverse personalities. The Baby-sitters Club provides a step-by-step look at starting a business. Kristy watched her mom make call after call looking for a babysitter. Then…blammo…the idea hit her – create a club of babysitters so that parents can reach multiple babysitters with a single phone call. Kristy enlisted her two closest friends, Mary Anne and Claudia, and, recognizing a need to add at least one more babysitter, welcomed the new girl, Stacey, into the club. The book lets the reader witness the creation of a business. From that first moment of inspiration we see Kristy organize her thoughts into a simple business plan (listing the members, advertising methods, and competitive advantage that separates them from all the other babysitters), pitch the idea to the potential club members, create a list of rules for the club, and advertise for customers. The girls also learn the benefit of putting processes in place and different advertising methods. Other business topics touched upon in the book include matching the right role to the right person, branding and logos, and working together as a team. The proverbial light-bulb went off in Kristy’s head when she saw a problem in the market (her mom trying to get a sitter) and thought of a solution (a one-stop shop phone number to access multiple sitters). If your daughter has an idea for a new business (perhaps slime sales?) or has a better idea for how something should work, ask her questions to help her think about how to turn her idea into a business. Who would buy your product? What types of people would be your customers? How would you advertise or tell potential customers about your product? How much would it cost you to make your product? How much would you charge for it? What are you really good at that would make you the best person to start this business? Kristy established a few rules and processes for her baby-sitters club. She created an appointment book to show who was available when and kept notes about each babysitting job so the girls didn’t make the same mistake twice. If you have rules or processes that help your house run smoothly, talk to her about them and help her write down some rules and processes to help her business run smoothly. Maybe she’ll think of ways to help your house run more smoothly as well! 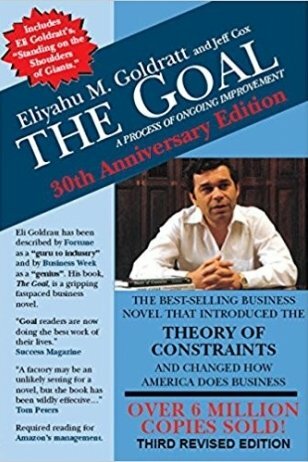 My favorite book about the processes needed for a successful business is The Goal: A Process of Ongoing Improvement by Eliyahu M. Goldratt and Jeff Cox. This is one of my all-time favorite business books – people I worked with were used to my asking them “where’s the Herbie?” Written as a novel, the book follows Alex Rogo, a plant manager at a failing plant, as he tries to save his plant from closure. It’s a change in his thinking, and an inspiration from chaperoning his son’s Boy Scout hike (where we meet Herbie), that helps him turn things around and provides business process lessons about the theory of constraints (identify and solve for the most limiting factor in a process) that are applicable to almost any business.